Once in a while a child is born with such preternatural patience that it puts the adults around him to shame. In the case of Boots, the trait has to be the result of genetic mutation. Or maybe it’s like in algebra, where two negatives make a positive. Dad and I are two different types of impatient. One’s not necessarily worse than the other; they’re just different. Dad can lounge around for hours, but when he’s ready to go, he’s ready to go. Right now. I can’t blame it on the Army – he was like that before he enlisted – though that type of “hurry up and wait” impatience is found in spades in the military. I, on the other hand, am a spazzball most of the time with brief bouts of catatonia after I finally burn myself out. No need to just sit around when you could be doing something. And then there’s Boots, who should have been named Job. He loves drawing and coloring, but he’s not happy with a few squiggles here and there. He uses every hue in the rainbow and keeps at it until every square inch of paper is filled. He’ll work for a half hour or more, not because anyone’s making him, but because he’s not finished to his satisfaction. 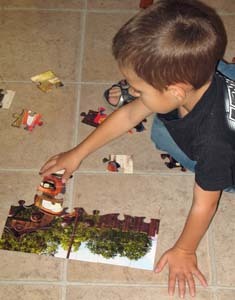 He’ll sit with a jigsaw puzzle and uncomplainingly work it, spreading the pieces on the floor, looking for color patterns and then turning pieces this way and that until he figures out which one fits where. The inevitable miscues fail to faze him. He simply tries again. He patiently practices his letters, letting himself off the hook when he goofs. “It’s OK. I’ll do it better the next time,” he’ll say. I have his determination, but it’s accompanied by a low tolerance for frustration. I’ll keep trying until I master something, but wanting to pull my hair out usually comes well before mastery. As I’ve gotten older, I’ve learned to remind myself to take a deep breath and mentally step back. That helps keep the frustration simmering below the surface, but it doesn’t eliminate it. Sure, I say all the right things to the guys – “Keep trying. Be patient. You’ll get it.” – but when it comes to applying them to myself, I just don’t feel it. Not deep down. Boots does, and I hope he never loses that.